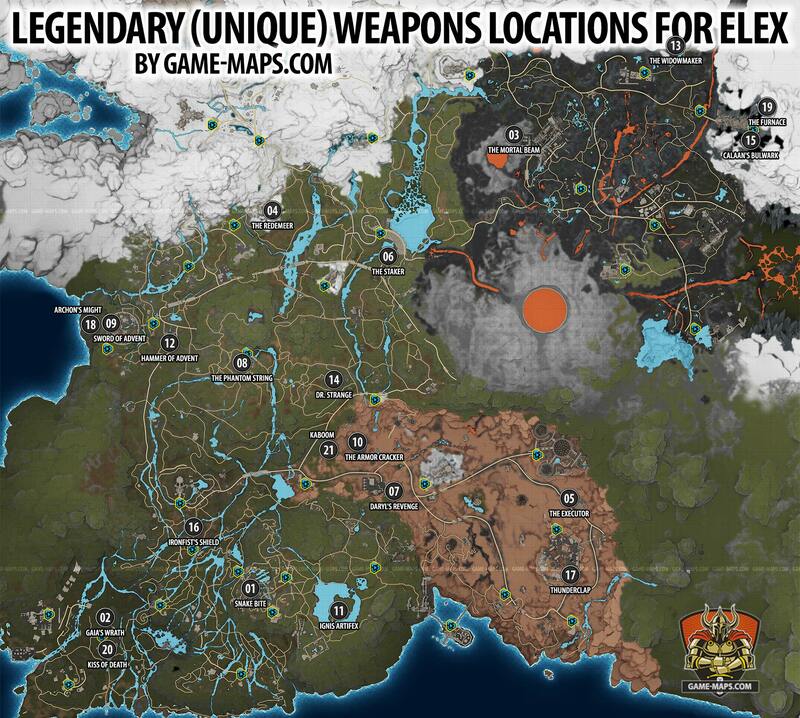 Map with location of Legendary Unique Weapons in ELEX. Where to find Legendary: Snake Bite, Gaias Wrath, Mortal Beam, Redeemer, Executor, Staker, Daryls Revenge, Phantom String, Sword of Advent, Armor Cracker, Ignis Artifex, Hammer of Advent, Widowmaker, Dr Strange, Calaans Bulwark, Ironfists Shield, Thunderclap, Archons Might, Furnace and Kiss of Death. ELEX Walkthrough, ELEX Maps, ELEX Guide & Wiki. Location: Inside Sinda's Shop in Goliet. Unique One-handed Weapon. This is a very special magic sword: its poison kills silently and painfully. Unique One-handed Weapon. The last of the Magalan master smiths forged this legendary weapon using all elementary primordial forces. Location: In the complex near volcano, near big sealed entrance. Unique Energy Weapon. The prisms and capacitors used in this weapon are of highest quality. Building this piece must have cost a fortune. Location: On roof of North Abessa Converter after you turn off Converter. Unique Energy Weapon. Unique plasma blaster. Kills quickly and reliably. Location: Top of the tower north of The Fort. Unique Energy Weapon. For many years, this ritual weapon was used for carrying out executions. After 1000 executions, the wielder killed himself with it. It has been an exhibit ever since. Location: In the big building down the Dam. Unique Ranged Weapon. Incredible penetration thanks to the combination of compressed gas and return springs. Location: High on the cliff in Tavar, better go here from Edan side. Unique Ranged Weapon. If you believe the rumors, the last owner kept an eye on this weapon his whole life. Location: On top of tower in Origin. Unique Bow. Rumor has it that this bow was made from the wood of the oldest tree on Magalan. This weapon doesn't only boast exxeptional workmanship but also incredible power. Location: Top of Clerics base in The Domed City. Unique One-handed Weapon. This weapon allows very heavy and hard attacks. Hundreds of tainted souls have been proselytized with this sword. According to legend, its owner can hear the pitiful screams of all the victims at night. Location: Center of Radioactive area in West Tavar. Unique One-handed Weapon. No one really knows where this radioactive blade was forged, but one thing is certain: this weapon can penetrate even the strongest armor. Location: Inside well in center of island. Unique Two-handed Weapon. This weapon once belonged to a great Warlord who hardened the blade in the fires of a volcano. Ever since thet day, this sword holds incredible power. Unique Two-handed Weapon. Just like the comet once bore down on Magalan, so shall this hammer bear down on its target and vanquish everything in its flames. Location: In small mountain cave behind Troll. Unique Heavy Weapon. Additional tension springs and difficult to comprehend modifications give lots of splatter for the bang. Location: In the basement of Reavers castle. Unique Heavy Weapon. Belonged to a freaked out Outlaw. People say he died while riding a rocket. Location: On upper floors in Cathedral in The Hort. Location: Inside Reavers Camp north of Small Camp. Unique Shiled. According to legend, this shield once belonged to the berserker Erik Eisenfaust. Location: Upper floor of Duke's treasury in The Fort. Unique Ranged Weapon. This weapon's modifications lead to one (or both) of the following conclusions: 1. It's custom-made for hunting giant creatures, and 2. its inventor is as mad as a hatter. Location: Inside The Claws headquarters below The Domed City. Location: In upper part of Factory in The Hort, use jet pack to fly there. Unique Heavy Weapon. This flamethrower was fashioned from old jet engine parts. The fuel injectors, however, are custom-made and very difficult to recreate. Location: In the cave in south part of Valley of the Damned. Unique Two-handed Weapon. This axe was found in the mountains near Xarcor. For heretofore unknown reasons, it is still infused with the chill of the Ice Desert. Location: Shelf on the cliff. Unique Heavy Weapon. This kind of weapon is usually only use in a fixed position. A powerful support of gun if you are strong enough to be able to use it on the move. Shot MOdes: Radioactive Projectile, Projectile, Shrapnel Projectile.